Last night I hosted a dinner party. It was me, my boyfriend Donald, my roommates Cory and Aubrey, and my good friend Bob (a former housemate of mine). I did all the cooking, and Bob, who has an extensive wine cellar, brought wine specially selected to accompany the meal. I was a bit pressed for time this weekend, since I had to pick up a rental car on Saturday afternoon (which is another story). Also I was kind of tired, and didn’t want to have to get up at 5 am to start cooking. So there were only two courses: the main course and the dessert. All recipes were courtesy of America’s Test Kitchen cookbooks. 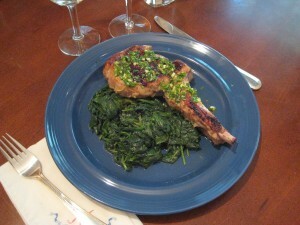 The main course was from the Quick Recipe cookbook: pan-seared veal chops with gremolata and lemon spinach. Gremolata is an Italian seasoning, a mixture of parsley, lemon rind and garlic. 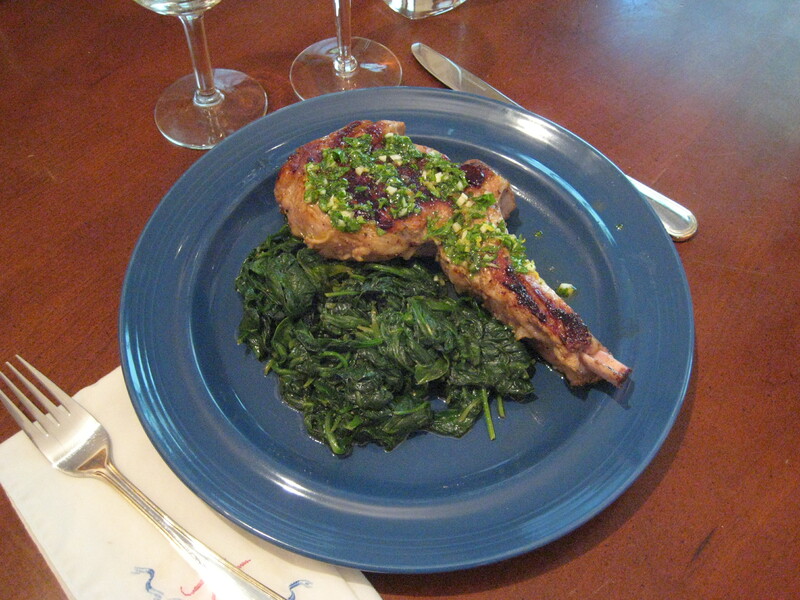 I mixed the gremolata with extra-virgin olive oil and spooned the mixture over the chops after they were cooked. The chops were pretty big, so I decided I didn’t really need a potato or rice side dish. I don’t eat veal very often, partly because it’s expensive and partly because these days you have to check with your dinner party guests to make sure they’ll eat it. So it’s a taste I’m not that familiar with. Donald, Aubrey and Cory had actually never tried it before (at least I think that’s what they said). Aubrey thought it tasted quite a lot like beef (not surprisingly, since it’s from the same animal), but that she kept looking at it thinking based on the taste that it would be red, and kept being mildly surprised to find that it was so pork-like in appearance. I guess I think it’s a little beefy, but a little like pork, too (except with the “piggy” flavor, if that makes sense). It’s definitely milder than, say, lamb. 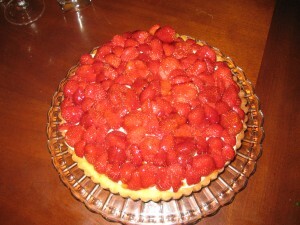 For dessert, we had the fresh strawberry tart from the New Best Recipe cookbook. It was the first time I’d made this particular strawberry tart, and maybe only the second time I’ve made one of these (with the tart pastry, the pastry cream, then the fresh raw fruit on top, glazed with melted jelly – red currant, in this case). It looked pretty just after I had assembled it, but serving it out was fairly disastrous. The recipe said to prepare the baked tart shell and pastry cream ahead of time, cool the tart shell to room temperature and chill the pastry cream, and then assemble the tart no more than 30 minutes before serving. However, when I tried to cut it, the tart pastry was so crisp that it shattered under the knife, and was kind of impossible to slice neatly. Also, the pastry cream gooped out around the edges of the cuts. So it was very messy! Bob, who is a more experienced cook than I am, said it’s usually better to put the pastry cream in the shell, then chill that for 30 minutes before topping it with the fruit. He said that the pastry cream will soften up the crust just enough in that time to make it cuttable, but not enough to lose all the delectable crispness. Despite the appearance of the uneven slices of goopy tart, it was very delicious, and the 5 of us all had seconds, and finished the entire thing in one sitting. To accompany the veal chops, Bob brought two Burgundies from the same producer, Domaine Francois Lumpp. One white and one red (for the curious, white Burgundy is almost always 100% chardonnay, and red Burgundy is 100% pinot noir). Both were Premier Cru from Givry; the white was the 2002 Crausot (I think Crausot is the vineyard, but maybe I’m wrong; sometimes I forget my wine knowledge) and the red was the 2001 Petit Marole. I liked both wines, though I thought the white was a little too old, and tasted kind of oxidized. But some of the other people liked the white better than the red. Some people actually liked the red better by itself, but the white better with the food. I still liked the red better with the veal, though I agreed that, with the fattier bits of the veal, the white was better. Also, the white was better with the spinach. To accompany the tart, we had a 1976 Johannisberger Holle Riesling Beerenauslese from the Rheingau in Germany. This was a very sweet white dessert wine (made from Riesling grapes). It was definitely my favorite wine of the evening, with a wonderful balance of sweetness and acidity, and a great flavor profile. It was a fairly decent match for the tart. It worked really well with the strawberries and with the crust, but wasn’t quite sweet enough for the pastry cream. My next “fancy” dinner will probably be my boyfriend’s birthday dinner that I’m cooking on the 3rd of July (not his actual birthday, but it’s a Saturday, and that’s the important thing). But I had better not say what I’m making, because it’s supposed to be a surprise! This entry was posted in Cooking and tagged America's Test Kitchen, Cooking, desserts, food. Bookmark the permalink. 2 Responses to Springtime Feast! It was all very good, too. You’ll have to make supper for us next time you visit. It all sounds good.